The onset of the 21st century has coincided with mounting scientific evidence of the severe environmental impact of global energy consumption. In response, governments and environmentalists on every continent have begun to re-evaluate the benefits of nuclear power as a clean, non-emitting energy resource. Today nuclear power plants operate in some 30 countries, and nuclear energy has become a safe and reliable source of one-sixth of the world’s electricity. This base has the potential to be expanded widely as part of a worldwide clean-energy revolution. 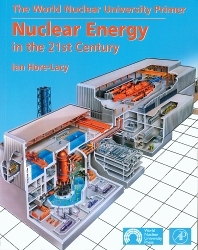 This edition comes with a Foreword by Dr. Patrick Moore, co-founder of Greenpeace, which attests to today’s worldwide re-evaluation of nuclear power. The World Nuclear University (WNU) is a global partnership of industry, inter-governmental, and academic institutions committed to enhancing education in nuclear science and technology. WNU partners include the International Atomic Energy Agency (IAEA), the World Association of Nuclear Operators (WANO), the Nuclear Energy Agency (NEA) of the OECD, and the World Nuclear Association (WNA). With a secretariat staffed by government-sponsored secondees, the London-based WNU Coordinating Centre fosters a diversity of collaborative projects to strengthen nuclear education and rebuild future leadership in nuclear science and technology.